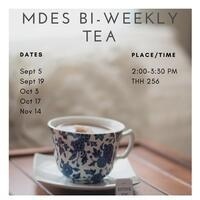 The Department of Middle East Studies will host a bi-weekly tea for students and faculty. Other refreshments will be included. The other dates are September 19, October 3, October 17, and November 14. Halloween treats will be served all day on October 31.